Treat them to one of our signature gift sets. finished with a hand-tied silk ribbon. Pair Black & White Wood and Sterling Silver Peugeot Salt and Pepper Mills. 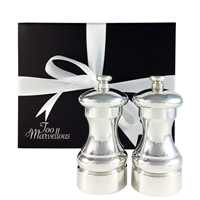 Hallmarked 925 Sterling Silver and Wood black & white Salt and Pepper Mill Set with Peugeot Mechanism. Gift Boxed. Traditional Capstan Shape. Silver Plated 7oz Hip Flask with Captive Top by Francis Howard Includes Filling Funnel. Gift Boxed and Ribboned. Sterling silver plated 7oz kidney shaped hip flask with captive screw top by Francis Howard. Filling funnel and pouch included. Made in England. Gift boxed with ribbon. Sterling 925 silver shotgun cartridge style hip flask by Francis Howard with sterling silver funnel. Gift boxed and ribboned. Comprises a 12cm pewter backed beard and moustache brush by the English Pewter Company and 100ml pump spray bottle of Taylor of Old Bond Street 'Leave-in' Moustache & Beard Conditioner and a 30ml tin of their fine moustache wax. Containing a traditionally shaped pewter shaving mug by English Pewter Company, an imitation Ivory small pure badger shaving brush by Taylor of Old Bond Street and a 57g block of their finest, traditional shaving soap. Featuring the English Pewter Company lidded shaving bowl. D.R.Harris' large imitation ivory pure badger shaving brush and a 100g block of sandalwood shaving soap. A pair of double old fashioned Whisky tumblers, hand finished with pewter base collar and stag head motif by English Pewter Company. Also English Pewter Company's stag head pewter spirit measure. All beautifully gift boxed and ribboned. Comprising a pewter backed, pure bristle military brush by the English Pewter Company and a 200ml bottle of Taylor of Old Bond Street's fine Sandalwood hair & Body Shampoo. Stag antler pure badger shaving brush, natural stag antler Mach3 razor both from the English Pewter Company and a 150g bowl of D.R. Harris' Windsor fragranced shaving cream. Gift boxed and ribboned. Five piece gift set featuring Taylor of Old Bond Street classic Sandalwood soap in wooden bowl, pre shave oil, aftershave, badger bristle shaving brush and drip stand. Gift boxed and ribboned. The Ultimate Soap-on-a-Rope Gift Set. Exclusive set featuring D R Harris Arlington soap on a rope, a natural sea sponge and wash bag with leather trim. Gift boxed and ribboned. The ultimate soap-on-a-rope gift set! Harris Tweed gents wash bag gift set featuring D R Harris pure badger bristle shaving brush, sandalwood shaving cream tube horn comb and shaving bowl. Gift boxed with ribbon. Shaving gift set including ceramic shaving mug, badger bristle brush and drip stand. Featuring Taylor of Old Bond Street. Boxed and ribboned. Sandalwood gent's grooming gift box including Taylor of Old Bond Street bath and shower gel, deodorant stick, shaving cream tub, wooden nail brush and a natural sea sponge. Gift boxed and ribboned! Bath and Shower gift set featuring Taylor of Old Bond Street Jermyn Street collection of Bath & Shower cream, Deodorant stick, 60ml tub of shaving cream, wooden nail brush and natural sea sponge. Gift boxed and ribboned! 12 inch dark wood Peugeot pepper grinder mill with heavy 925 sterling silver base collar and finial. Exclusive, gift boxed and ribboned. 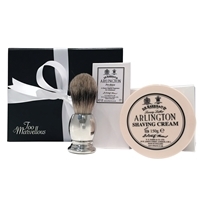 A classic gift set with D R Harris' Arlington fragrance and a fine English pewter, badger bristle shaving brush. Beautifully gift boxed.